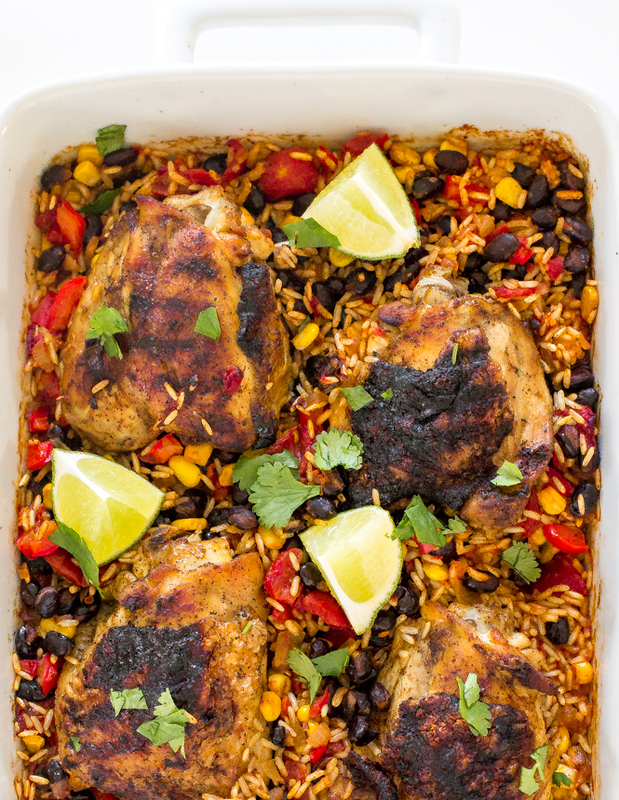 Mexican Chicken Rice Bake. 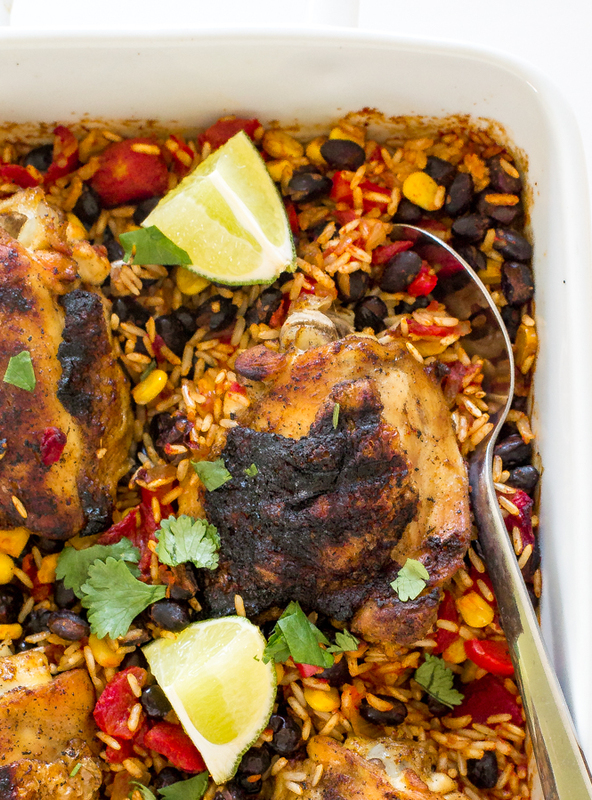 Blackened chicken thighs served on a bed of Mexican rice, black beans and corn. A super easy dinner! I love one pan dinners. 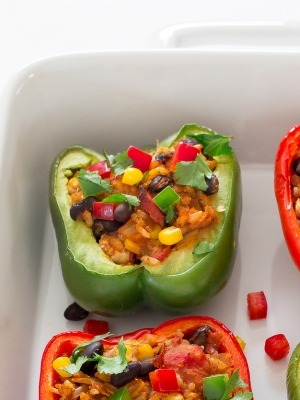 They make throwing together dinner so easy and saves on cleanup. 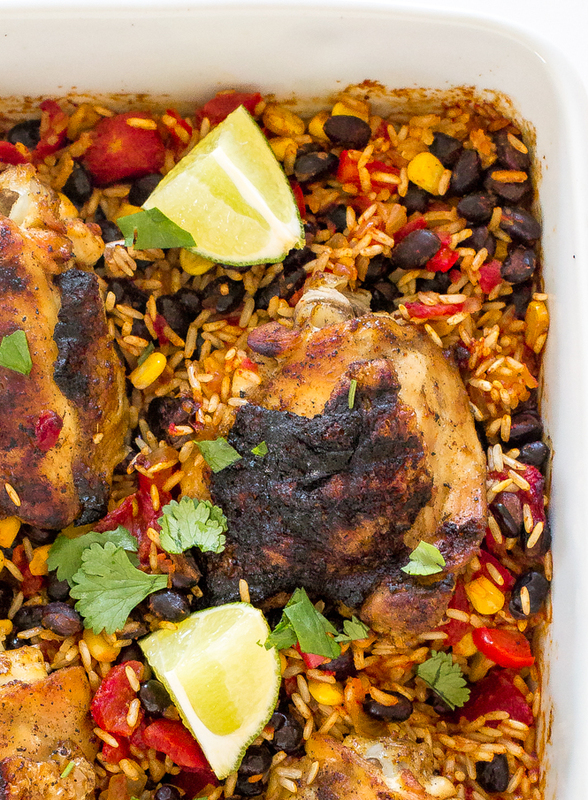 This Mexican Chicken Rice Bake is loaded with flavor and takes only 10 minutes of prep time. For this recipe you can use an oven safe pot or dutch oven. I start by blackening my chicken with a mix of spices and a little bit of oil. I make my own homemade taco seasoning as a rub for the chicken. The recipe is included! If you want to skip the extra step you can always buy the pre made taco seasoning. The chicken thighs get seared in a hot pan before baking so they get a nice crisp on the outside and added flavor. Once the chicken is browned I remove it from the pan and add saute onion and red pepper. Rice, garlic, taco seasonings, tomatoes, chicken broth, beans and corn then get added. When this dish comes out of the oven serve with a squeeze of lime juice and fresh chopped cilantro. (I also like to stir in a little sour cream + chipotle in adobo sauce) It is AMAZING! Enjoy! 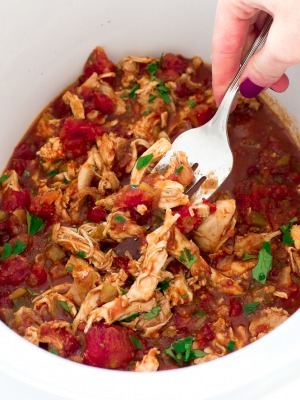 Add chicken, oil and taco seasoning to a medium bowl. Rub the chicken to coat with the oil and seasoning. In a dutch oven or oven safe pot heat 1/2 tablespoon of oil over medium high heat. Add in the chicken and cook until browned on both sides. Make sure not to burn. Remove the chicken from the pan and set aside. Add onion and bell pepper to the same pot. Cook for 3-4 minutes or until tender. Stir in garlic and rice and cook for an additional minute. Add in diced tomatoes, chicken broth, beans, corn, taco seasoning and adobo sauce. Bring to a boil then reduce to simmer. Cook for 3-4 minutes. Place the chicken thighs back in the pot with the rice. Place in the oven and cook for 30 minutes covered. Take off the lid and cook for an additional 20 minutes or until the chicken reaches 165 and the rice is tender. Take out of the oven and stir in lime juice and sprinkle with fresh cilantro. Add all of the ingredients together in a medium bowl. Stir to combine and set aside. You will have some seasoning leftover.